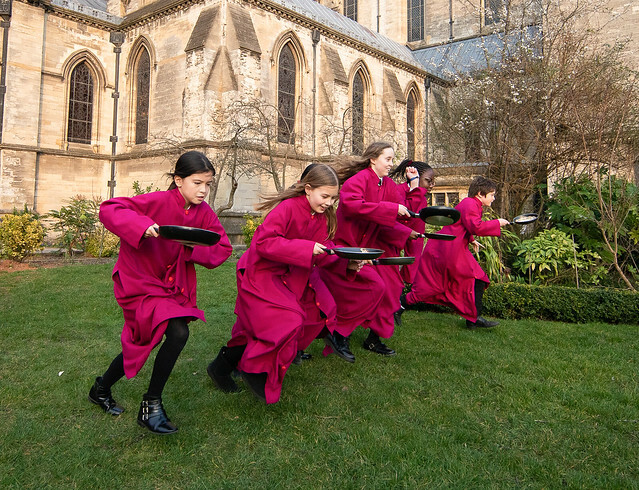 A series of pancake races, held in the beautiful cathedral garden, were organised by Culture & Heritage Officer Julia Stafford and Master of Music, Daniel Justin. Choristers competed against each other in perfecting their pancake flips and running skills. The choristers meet twice a week after school to prepare for the Sung Masses on Sundays in the Cathedral and were very eager to warm up for their rehearsal with the pancake races. The winner of the race was Hebe, and she was awarded the first prize by the Dean of the Cathedral of St John the Baptist, Provost Paul. Pictured are choristers at Cathedral of St John the Baptist in Norwich taking part in some pancake races. Pictures by David Street. Click below for a full picture gallery.